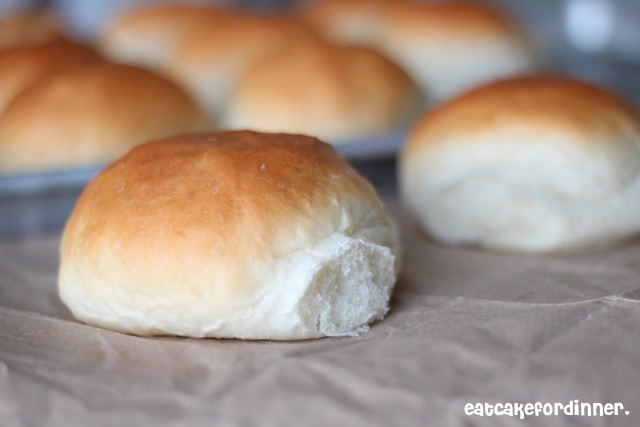 I had a whole, nice, detailed post typed up about these rolls. Then, something really strange happened. I must have clicked some kind of button or link, because my whole post was gone and it was replaced by another post? WEIRD? Undo wouldn't do anything, so I was S.O.L. Now, all I feel like saying is these rolls are delicious. The inside is super soft and the outside is slightly chewy. Serve them plain, smothered in butter or use as a bun for sandwiches. They didn't necessarily "scream" French Bread to me, only because the crust was slightly different. Nonetheless, the flavor was outstanding and I will make them again. In the bowl of a stand mixer, combine the warm water, yeast, sugar, canola oil and salt. Mix in 2 cups of flour. With mixer on, gradually add remaining flour, as much as needed, until the dough has pulled away from the side of the bowl. It should be soft and smooth and slightly tacky to the touch. Knead the dough until very smooth and elastic, about 5 minutes. Cover and let rise until doubled, about 1 hour. Punch down dough and turn out onto a lightly greased counter. Divide into 12 equal portions and form into balls. Place on a baking sheet and cover. Let rise until doubled, about 45 minutes. Preheat oven to 400 degrees. Bake for 12-14 minutes or until lightly browned and cooked through. 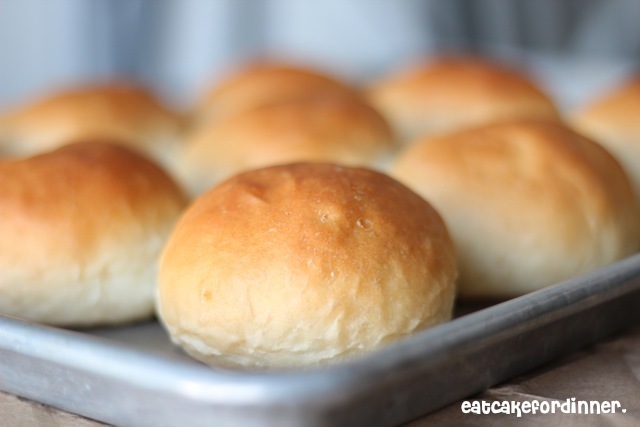 Jenn's Notes: I baked my rolls for 16-17 minutes and they were perfect. I brushed the tops with a little butter right when they came out of the oven. Guess what! I've nominated you for the Liebster Award! Check out this page on how to accept!! Hi Jenn! These look delish! I'm such a carb girl. I found you at TT&J, and am now following your blog. Have a great weekend! I am a total carb girl too! Thanks for following. Cant wait to try these they look so simple and amazing. Very simple and super amazing!! These look so great and sound so easy - I'm just learning to bake bread and this is one I think I can tackle! These are a really good beginner roll. Let me know if you try them. the post thing happened to me before...my son taught me this. Do not hit the back arrow, but hit the control key along with Z-it works! Those look so good!!! I am pinning them to try soon. Totally agree! It is my weakness! These look delicious! I so love a nice roll fresh out of the oven. I'd be thrilled if you'd link up at this week's Off the Hook! Nothing beats a warm roll!! Thanks for the invite.